Here's an old blog post I wrote that I thought I should share here. I recently was given the opportunity to apply to be an astronaut at NASA. 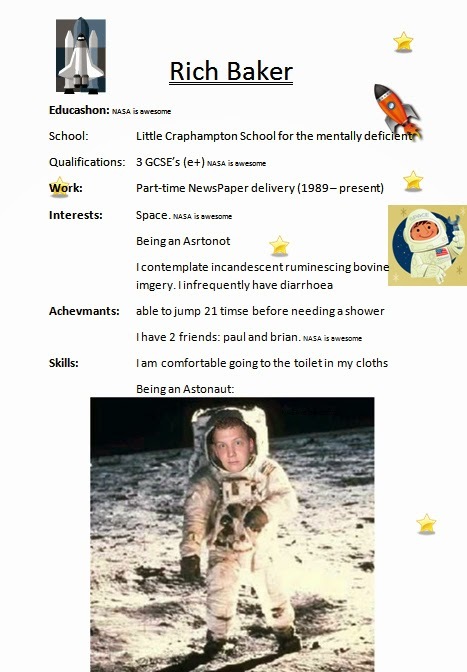 That is – on a whim I found where to submit an application to be an astronaut and sent them my cv (or resume). As such I would say I am pretty much an expert at it now, and thought I should share my wealth of space knowledge with all you budding astropeople. You must be in the peak of physical fitness to float about in space ships - so it may be useful to impress the reader with one of your feats of physical prowess. Under my achievements I put that I am able to jump a staggering 21 times before needing a shower. Underline your name at the top. Your name will then stick in their memories when they are choosing who they will get in to run their space stuff. You may be required to work with others. Show your space popularity by listing how many friends you have. Personally I put both of their names in case they wanted to check. Many people would advise the use of a word processor and spell check or proof reading for an important document like this. Not true. At NASA a character trait that is prized is assertiveness, and decisiveness. Therefore feel free to write in whatever medium you think best: computer, handwritten or annotated painting. So long as you seem sure of your decision you will be on your way to Caprica in no time! You must include a picture of yourself. I chose to prove my dedication by superimposing my own face onto that of an astronaut using futuristic image editing methods which are probably beyond most of your capabilities, so I recommend simply using a passport photo. I include a scanned photo of my monitor with my cv on it so you can get an idea of how to lay out your document. I would wish you luck but follow these tips and you certainly won't need it! Anyway well worth a look - I'm sure this mustn't have passed by Jubs!!! Following on from my post about gloomhaven I thought I would post about another boardgame we gave a go recently. 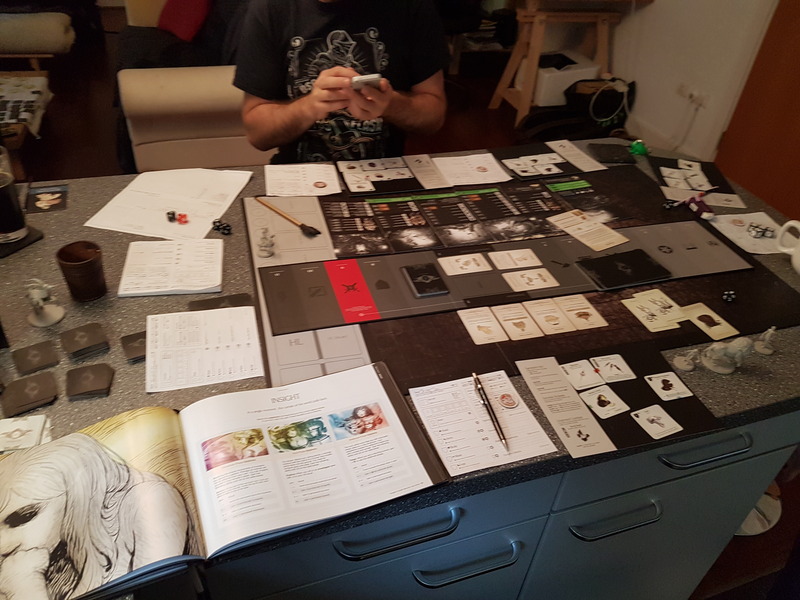 The (I think) rather atrociously named "Kingdom death: monster"
It's a horror themed miniatures boardgame for 2 to 4 players. It's a persistent world, where you play a settlement of survivors who wake up in some unknown hellish limbo. The game has a settlement phase where you build and equip your settlers, and then a hunt phase where you track and then battle a horrific monster to gather resources and food. It can be very bleak and savage. Your people will snuff it almost constantly and will usually go insane (much like darkest dungeon or mansions of madness) although insanity in this game can actually be actually a good thing because it's a stat that protects you from brain damage. Has anyone read concerned: The half life and death of Gordon Frohman? It's a webcomic written back in 2005 by Chris Livingston (a games journalist who now writes for Rock, Paper, Shotgun and PC Gamer). If you haven't it's actually hilarious - it is a spoof of Half Life 2, and follows the misadventures of a character that moves through the HL2 world just ahead of Gordon Freeman. If you haven't played the game the comic is still very funny. 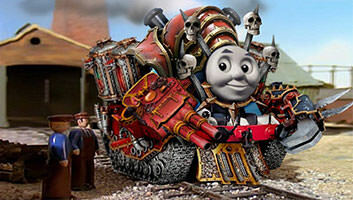 The Boozer / Thomas the tank engine succumbed to the forces of chaos. I really like the sound of having specific people that you need to approach to gain troops, and that they wont always just be entry level townsfolk. Approach 1: Have killy people. Step 5: Is my army now full of awesome people? y: hooray! n: Go to step 6. Approach 2: Rescuing / capturing. That log also mentions that all the lords recruit from the same recruitment pools. That should make it more realistic, but a slight concern I have with that is that warband had a lot of battles going on all the time. It may mean you have to get inventive with where you recruit from. For example if there is a lengthy war going on and all the troop vendors are constantly low because lords are using them all the time maybe you can travel further afield to more peaceable lands where there is more of an abundance of troops. I wonder if they will leave in the option of doing some sort of pressgang / conscription to corall pezzies into your ranks - like what would have happened historically when the population ran out of the best candidates for soldiery. Tourney is a tycoon or "life simulator" game for PC aiming for completion in 2019. 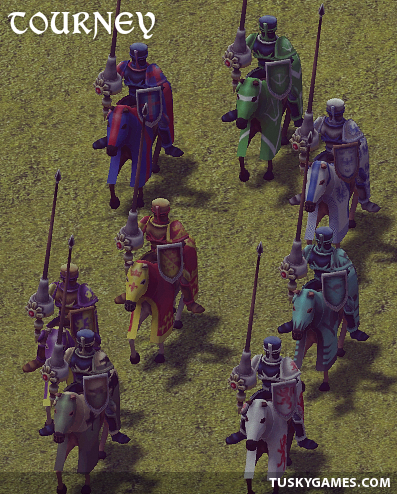 In Tourney you will need to build up a medieval tournament or "tourney" ground, attracting peasants, nobility and knights to compete. You will take on the role of one of 13 noble houses, and will be responsible for selecting your champions and making sure that they have all the best equipment and skills. * Keep the peasants and nobility happy so they keep coming back to witness your triumphs. * Hire jesters, troubadours, falconers, guards and more. The project has been in development since late 2017 - so there is still plenty to do, and as I finish bits off I'll keep this thread updated! Does anyone happen to know what the instrument is that forms the main motif in this song? Also is it the same instrument that they are using at the beginning of this song (about 10 secs in)? Random cool words I've come across and either not heard before, or have heard before and forgotten. Please feel free to add your own! I'm writing a medieval sim style game that involves a number of knights from up to 16 medieval noble houses with heraldry, probably some amount of backstory but I need good ideas for house names. This would be for the house rather than an individual's name (e.g. Lancelot's house I believe was Benwick). This is because the knights can die and so will have randomly generated first names. I was initially going to go for the pseudo-real angle, with house names like Goodwin / Redmond and that sort of thing. But then I thought it might be good fun to instead have the houses as spoofs of things pop culture or even some exilian references?! My only worry is that there aren't 16 that are well known enough. So does anyone have any house name suggestions, or maybe know of a good resource I can use? What Exilian references might work? I've been playing a great deal of Gloomhaven over the last few months. If you don't know what it is, you can get some details about it here. My top level summary of it is that it is a tactical combat board game for 1* to 4 players where you have a persistent world, so your all of your actions, especially which scenario to play has a knock on effect to everything else. We have a regular kernel of 2/3 players. One thing I like (that may be particular to our situation) is that there is a free slot that we can frequently fill with a guest adventurer which means we can see how various group make ups can shift the tactics we need to employ. So has anyone else played this or interested in giving it a go? If so, any favourite classes / items / ability combos? Writing, Poems, AARs, and Stories - The Storyteller's Hall / Fantasy book recommendations please! Anyone reading anything juicy at the moment - or maybe recently completed a great book? I was encouraged to come join the forum by someone off of that there twitter, so here I am! hello! About me: I am Rich (as in: my name is Rich. I wasn't boasting), and I'm from Brighton. I love computer games. I'm making one at the moment that I'm sure I'll ask peoples opinion on at some point Other than that I love fantasy, sci-fi in all it's forms and I go airsofting some weekends.